In my 9 years experience in digital marketing I’ve been asked just about every question about Title tags and Meta Data you can imagine. From broad “how do you write the best page title for SEO” down to “How many keywords do I add in?” or “is it better to use a hyphen (-) or a pipe (|) to add my brand name?”. Despite the changes in SEO, the goal has always been optimal search performance it’s just that the exact method has changed over the years. In general my response has always been that there is no exact science to the writing and structuring of title tags, however, there are some “best practice” guidelines which have always worked well for me, and I will share with you today. I also prefer the use of hyphen for SERP querying on exact-match titles, through which the use of pipes may restrict the data returned for your query. Each word in the query above, including the hyphens, are emboldened. So if you’re a power user who’s likely to be querying titles on a large scale you may prefer the use of hyphens. Also, in the video Matt quite rightly says that the use of hyphens vs pipes may potentially impact the user experience and the Click-Through-Rate (see point 6 below) so you may wish to test both to identify which works best for you. 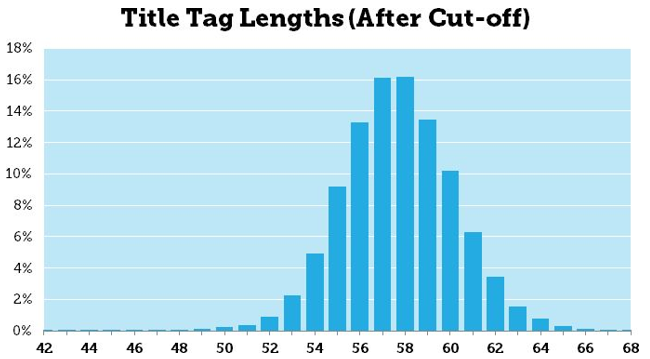 For a long time SEO’s focused on the character length of a title tag as the most important element when structuring a title tag; but over recent years the industry has gradually leaned towards the evaluation that pixel width is the best way to determine the adequate length of a title tag, rather than character length. This shift in direction was reiterated when Google changed the search interface on both desktop and mobile devices changing, amongst other things, the size of title tag within organic search. Through this change Google’s truncation of title tags was altered, seemingly rendering title tags shorter. This lead to a lot of research into how Google determines the width of a title, through which pixel width was seen as more accurate way to measure title tags in comparison with character length. The titles displayed within Google’s SERPs use a proportional Arial font which means that characters such as b’s or m’s use more space that i’s or 1’s. Likewise capitalisation can also be a contributing factor. Best practice is to remain under 512 pixels in width which generally consists of 55 to 60 characters (which is, let’s be honest, an easier way to measure title tags for most!). However research by Moz indicates that cut-off title tags ranged in length from 42 to 68 characters, so it really depends on the characters used within your title. There are also other factors to consider, such as Google bolding keywords within the title relevant to the users search query, through which bold characters will consume slightly more pixels. It’s a minor consideration, but a consideration nevertheless if you want to categorically avoid truncation. Moz also released this handy title preview tool which simulates Google search results, allowing you to specify and test the appearance of your title tag. Otherwise, if you’re a ScreamingFrog fan you’ll be pleased to know they also now have a SERP snippet emulator to preview the appearance of title tags. Ensuring the title tag for your landing page leads with your primary target keyword(s) has always been deemed as a relatively important factor by industry experts. The 2013 search ranking factor survey scored “Keyword is the very first word/phrase of the title element” 5.6 out of 10 (1 being of no importance, 10 being super important). Do not stuff your Titles with keywords. Chances are that if you’re targeting more than 2 or 3 different keywords per page then you might want to re-think your page targeting strategy. Targeting ‘Blue Widgets’, ‘Red Widgets’, ‘Green Widgets’ and ‘Sky Blue Pink with Red Dots’ is probably not appropriate and you’d likely need to consider separate landing pages for each. 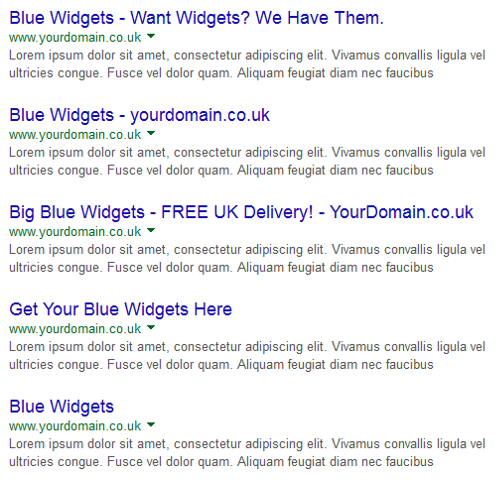 Targeting ‘Blue Widget’, ‘Blue Widgets’, ‘Big Blue Widgets’ and ‘Big Blue Widget’ on a single URL is probably acceptable. Alternatively, depending on your target keywords for the landing page in question, you may be able to tailor the title to appeal to a longer tail search query. For example, the inclusion of the words “new” or “used” may open the page to long-tail search queries such as “new big blue widgets”, “used blue widgets” or another relevant variant. The exact format is dependant on the circumstances of your keyword targeting. It is perfectly feasible for multiple keywords to be targeted on a single landing page; but as a general rule of thumb, if you find yourself struggling to incorporate each of your target keywords into a single title then you’re probably over doing it. Appending the brand to the end of a title tag is a widely utilised technique within the industry. This approach can help to reinforce branding to potential customers. For new customers the use of branding within the title can help to raise brand awareness. For existing/repeat customers it can help underpin your brand, potentially putting a recognisable brand into the mixture of search results. Bear in mind that the pixel width/character count of the appended branding will consume the available space. There is no golden rule on the addition of branding with a title tag. It is optional so you may choose to omit brand in place of a stronger, more descriptive call to action. One thing I would mention in support of appended branding is that sometimes Google will rewrite weak titles. When this does occur Google often tend to append branding to the title tag. So Google clearly perceive branding within a title to be important to a searcher. Just check out these examples of Google’s title manipulation for EE! Arguably more off-putting than enticing in my opinion, but nevertheless in this instance Google have amended the title for increased branding on search queries for “EE” and “EE Business”. Whilst the length of a title is important for ranking purposes, and keyword referencing even more so, there is another crucial factor to bear in mind – Click Through Rate (CTR). The title tag is potentially one of the first engagement factors visible to your customers therefore utilising strong message to entice the customer and enhance CTR is imperative. The SERP snippet (which incorporates the title tag and the Meta Description for each landing page) can make or break the customers initial perception of your business and, if utilised correctly, can set your business apart from your competition. Combined with organic search optimisation many businesses harness the power of paid search to maximise search traffic. If you’re running paid ads through Google Adwords or Bing Ads then chances are you have experimented with various ad text combinations to determine a blend which is effective for your marketing efforts. If this is the case then it is logical to use these learnings to support organic search optimisation, utilising any powerful and proven PPC calls to action (CTA) within your title tags (and/or Meta Descriptions!) 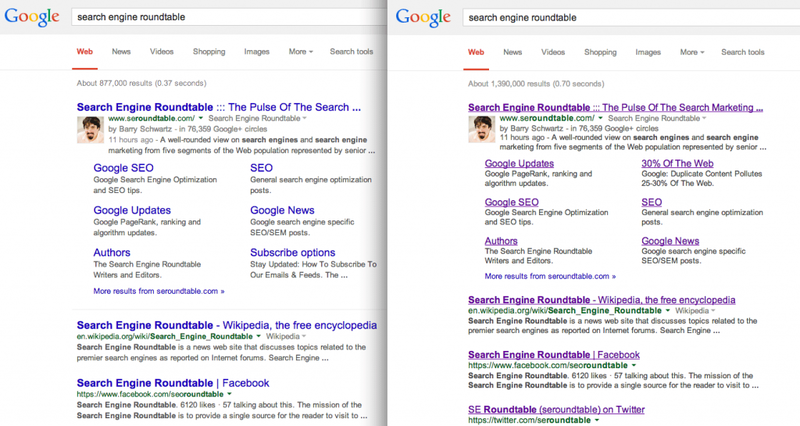 to maximise the potential CTR on organic search listings. If you’re not currently operating a paid search campaign, perhaps investing a small amount to test CTA and quality of traffic around any given keyword can yield greater returns for your SEO efforts in the long term. It’s pertinent to mention (again) that title tag optimisation is not an exact science. The guidelines above are widely regarded as best practice technique to maximise organic search ranking and click-through but your approach may vary depending on your objectives and your own bespoke implementation. I often hear people saying how well certain techniques work for their competition (which is not just restricted to title tag optimisation!) and in some cases you can often learn a lot from your competition. But in other cases what works for your competition may not necessarily work for you (and vice-versa). So test, refine and keep testing until you’ve found a winning combination. Also like most things organic search related the best practice techniques which work today may not necessarily work tomorrow. I’ve seen businesses left behind by not keeping up to date with changes to best practice (again not necessarily restricted to title tag optimisation!) so be sure to stay on top of recent developments. This entry was posted in SEO and tagged title tags. Bookmark the permalink.